My name's Jessica and I have been a caregiver for Andrea my daughter for about 14 years. My son Andrew is 19 and my other daughter Mckenna is 16, they both have the same blood disorder. So, technically i care for both of them as well but Andrea is symptomatic, the other two really haven't been. I think we've always kind of known that there was something going on with her a little different. She's always had numerous bouts of pinkeye since she was born but we were officially diagnosed before she turned 4. Andrea went back and forth between her pediatrician and her ophthalmologist for about two weeks before they finally referred her to the children's hospital. 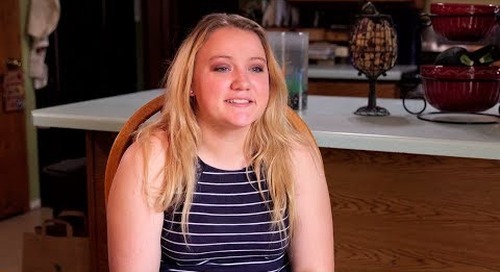 By the time she was referred to the children's hospital in Chicago she was actually septic, so she had an infection through her whole blood stream, through her whole body. And even once she was admitted to the children's hospital in Chicago, the blood disorder's so rare that she was misdiagnosed with different ailments before they finally figured out - maybe almost 3 months later what her actual diagnosis was. So, it took quite a long time. I guess, there was a lot of 'not pleasant' memories but i started to get really nervous about how many times they were sending her though a CT scanner to scan her head. You know you worry about all that radiation and cancer and what are going to be the long term effects and when we did initially get her diagnosis, i mean it was a relief at some level but at the same time there was no treatment available. So it was very stressful to find out that my daughter was just diagnosed with something that there's nothing they can do for her at the time. One of the biggest things that i learned from her hematologist in Chicago was that i was going to have to be Andrea's advocate for life. Because her blood disorder is so rare that even when you take her to a physician as a 17 year old they have no idea what you're talking about when you tell them that she has plasminogen deficiency. They've never seen a patient with plasminogen deficiency, they have no idea how to treat it. The other thing is, if you search Facebook there's a support group on a Facebook page called 'Ligneous Congenital Deficiency' or 'Plasminogen Deficiency and Ligneous Conjunctivitis Support Group' and there's a whole group of people there and we all support it each other, its nice. You can get advice from other mums or dad or caregivers, we all talk to each other about it and that's been a big help. There's actually a drug that's in trial currently so that's our big hope and answer to our prayer's that we've had for 14 years so that brings me a lot of hope. At Prometic Life Sciences we are committed to addressing unmet medical needs in rare diseases such as Congenital Plasminogen Deficiency (PLGD). Sarah Bein, MD, is a physician but also a patient with plasminogen deficiency. In this video clip, she talks about the pathophysiology and genetics of this rare condition. Plasminogen deficiency used to be treated with surgery, but trauma such as surgery can lead to the condition getting worse, Sarah Bein MD explains.